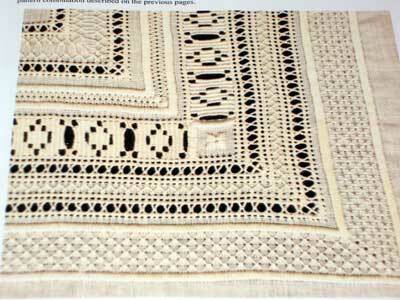 Schwalm whitework embroidery is often used to adorn tablecloths, table runners, and household linens of various kinds. Besides the beautiful and lace-like embroidery featured on Schwalm pieces, Schwalm work often depends upon the finishing of the embroidered piece with a fancy hem. 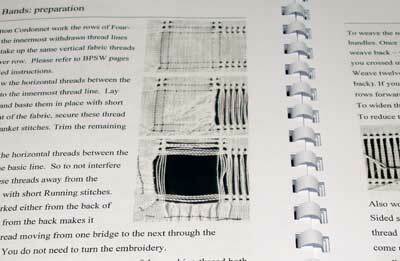 A couple months ago, I introduced you to Luzine Happel’s thorough book on Schwalm embroidery – Basic Principles of Schwalm Whitework – which was newly translated into English. Today, I want to show you her latest book translated into English, Fancy Hems. 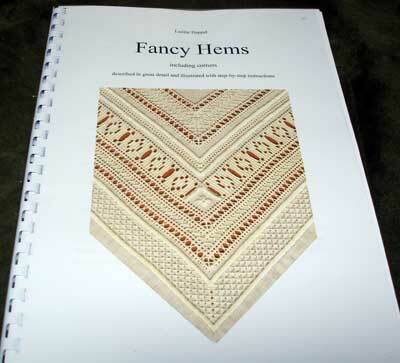 Fancy Hems is a book that any needleworker interested in drawn thread embroidery or whitework would find interesting, informative, and useful. It is not merely for folks interested in Schwalm embroidery in particular. 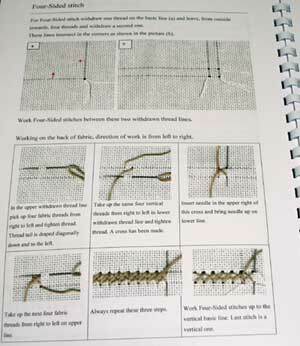 The techniques explained in the book are suited to any kind of drawn thread work, really. Like Luzine’s Basic Principles of Schwalm Whitework, Fancy Hems is a self-published book. 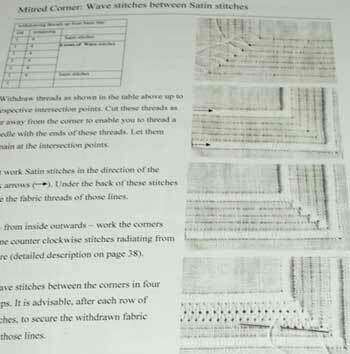 Within its pages, you will find step-by-step instructions for creating the fancy openwork and drawn thread hems that often accompany Schwalm embroidery. The instructions are cleary photographed, so that you can follow each step of embroidery. And the English text is clear and precise. The book begins with simpler fancy hems and works its way slowly to more complex hems. Featured throughout the book are pictures of magnificent embroidery that has been “finished” with the addition of a beautiful hem. Each type of hem is thoroughly explained and demonstrated in the book. Watching the intricate designs of the hems unfold before your eyes, though the photos, is amazing – Luzine makes it look so simple! And because her instructions are good, creating a unqiue and intricate embellished hem area does become relatively simple. All the basics are discussed, by the way, before venturing into the more complex embellishment. 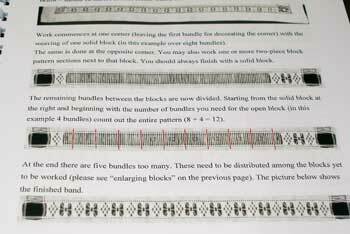 So, if working something like the above drawn thread bars featured in the text, you not only learn how to embellish the bars, but you learn the basics of how to create the bars in the first place – a nice tidbit of instruction for those interested in drawn thread work in general. Wouldn’t it be something to finish the edge of a tea cloth like this? It’s amazing, isn’t it? In the most recent issue of Piecework Magazine (Sept. / Oct. 2009), a one-page article focus on an embroidery guild group in Canada who began working through the Fancy Hems book, each creating their own fancily-hemmed cloth. I think that would be a fun and challenging group project – to take a book like this and have each person compile their own “stack” of hemming motifs. I was glad to see that article in Piecework. But even more than that, I was so happy to see Luzine’s newly-translated book, which will certainly become The Definitive Guide to drawn-thread fancy hems. If you’re interested in obtaining a copy of this book, feel free to contact Luzine via e-mail. She takes Paypal, which makes ordering from Germany very easy. I have to thank Luzine for sending me the book, which was quickly followed by a real treasure chest of Schwalm related instructional and inspirational books – and some linen! Oh, linen! How I love linen! Thank you, Luzine! Luzine has actually self-published a whole slew of books in German on Schwalm embroidery, and I do eventually want to show you all of them. They are amazing – and So Thorough! A few are in English, but most are in German. Still, the step-by-step photos make the books accessible even for those of us who don’t speak or read German. In the meantime, though, if you are looking for books on filling stitches for Schwalm work or drawn thread embroidery, you can ask Luzine what she has available. One of her books instructs on 175 (yes, 175! – that’s a LOT!) filling patterns. It’s amazing! 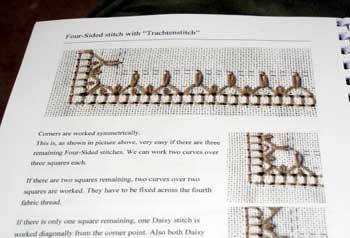 She also has a really nice book of Schwalm patterns for a variety of projects. I’m really looking forward to making use of it. The more I look at Schwalm work, the more I fall in love with it! And she’s got some really pretty patterns in this book. I’ll review that one a bit later, in detail, so you can see what it looks like. And she included some little books from the Schwalm Museum in Germany – they’re full of clear black and white photos of various Schwalm pieces. Oh, if I could just reproduce them for you here! I think you’d be in awe of the work! The thing that really attracts me about Schwalm whitework is that, though it is predominantly whitework, the techniques involved spill over into so many other areas of surface embroidery, while at the same time integrating extensive drawn thread and pulled thread techniques. 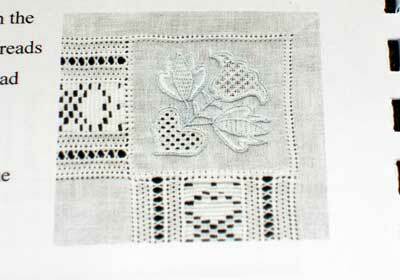 I think that’s why I had so much fun with my Schwalm chicken and pomegranate on my whitework sampler. And what about my Schwalm project that’s currently underway (taken from Luzine’s Basic Principles of Schwalm Whitework)? Well, I did indeed make the switch from another project so that I can focus on the Schwalm project during my 15-minute sessions, and I have enjoyed working on it in spurts. I actually accomplished a good bit of stitching on Wednesday afternoon of this week, which was nice for a change! I’ve finished the buttonhole stitching on one motif, and I’m ready to move on to the chain stitching, before starting the filling. I’m having fun with it – I’ll update you with progress photos soon! In the meantime, if you’re interested in any of Luzine’s books, drop her an e-mail. Thanks Mary, for the wonderful and informative review. Whitework is addictive. Whoa, those are impressive! I once put a scalloped hem on a batiste baby dress and thought I was being "fancy". Well, now I KNOW that insanity is present in fields other than rabbits…. What a PHENOMENAL resource! I don't even want to think about how much work this took and that's only one book!?!?? How did you stumble across this author's books? They look amazing! I am working on a couple of table linen pieces using this book. One in olive green belfast using the second border in from the outside which I am hoping will be finished in a couple of weeks. It's 24 x 24 finished size. The other is the complete border on 38 count Italian linen. Finished size will be 32 x 32. Our group has also done place mats using these borders as well. They are really relaxing to work on. Simple to take with and work on wherever. I highly recommend any of Luzine's books. The pictures are worth a thousand words. Thanks, Pam, for the input – your linens sounds really nice! The olive green, especially – what color thread are you using, may I ask? White? That would really be beautiful! Jeanne – I was fortunate to receive a copy of the Basic Principles of Schwalm Whitework from Joey Colbert, who has helped with the translating and editing of the English editions of Luzine's book. Luzine's books are by far the best and most thorough books I've seen on Schwalm work, but also on drawn thread techniques, as well, since the drawn thread areas on Schwalm work are so varied. They're great books, and really worth the investment for anyone who is interested in whitework at all. Thank you for this interesting article. A surprise awaits you on my blog. I would LOVE to receive this book as a gift. If I were to start a project right now it would be an heirloom bib for my new grandniece. I do some type to specialty, heirloom bib for all of the grandchildren and grandnieces and grandnephews. This book would be a big help in creating an original design. Oh! Oh! The photos are so inspirational. They are absolutely wonderful, and I can't wait to start a piece. I hope the gods of luck are shining on me, I would love to win this book. Thank you for showing us this book. I love hem stitches and the photograph of the multiple hem stitching is divine. A cloth with this much on the edge doesn't really need anything in the middle. I would love to own this book and appreciate the fact that it opens flat. Hi Mary, I’m really enjoying reading articles linked from today’s post (8/15/18). 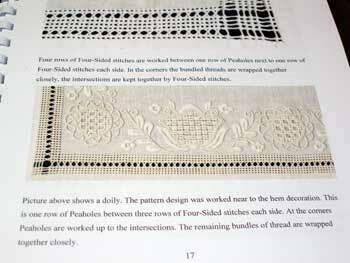 FYI: The above link to the to Piecework 2009 no longer links to the article mentioned. I see similarities with Hardanger, which I learned in a class at the Embroider’s Guild convention a bazillion years ago. Looking forward to exploring Schwalm more. Thanks Mary, for guiding us here!